Han’s Worst Hits of the 80’s- “Sister Christian” by Night Ranger. 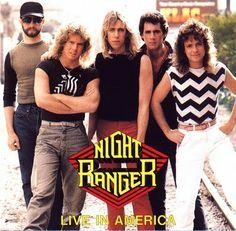 Night Ranger had six top 40 hits- and this was their biggest- peaking at #5 in 1984 While none of the were worth writing home about Sister Christian was the worst- by far. Even their best song You Can Still Rock In America- which didn’t make the Top 40 is kind of light-weight pedestrian Huey Lewis School of Rock and Roll stuff. Kelly Keagy the drummer for Night Ranger wrote and sang this ‘power ballad’ for his sister Christy. He came home to visit and was struck about how quickly his teenage sister- ten years younger was growing up. You’re motoring. What’s your price for flight? In finding Mr. Right? Jack Blades was the singer on most of Night Rangers songs- but Keagy sang this one. Originally he was singing Sister Christy but the rest of the band thought Christian sounded better. The members of Night Ranger actually liked this song. I think that tells you all about why they soon faded away. I haven’t seen Boogie Nights. I have been told that i need to. I remember this song being blasted from the High School parking lot…and cringing all the way to my car. This song has grown on me. Now I can;t help but sing along. You’re tough on a lot of songs! This one ain’t so bad. Agree the lyrics are cringe worthy.